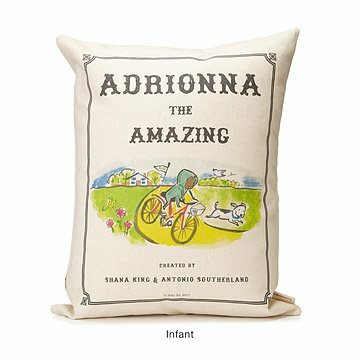 This personalized pillow is a tribute to your favorite amazing little person. Cast your favorite little person as an amazing literary figure--whether a newborn making a debut or a young child in the first few pages of his or her thrilling tale--with this delightfully personalized pillow, featuring custom, storybook-inspired illustrations on each side and your custom rave "review." For newborns, it's an imaginative antidote to ordinary birth announcements; for young children, it commemorates the magical story of early childhood. For all, it's a soft, safe, and huggable tribute to each child's precious individuality. The charming illustrations by Patricia Carlin evoke timeless storybook classics, creating a unique and memorable custom pillow that will transition from nursery to bedroom to grown-up keepsake. For more storybook titles, check out our Personalized Storybook Pillow - Adventure, Personalized Storybook Pillow - Brave, and Personalized Storybook Pillow - Legend. I can't say enough about this gift. It's my go-to for friends with new babies and they all love it. It's cute, comfortable, personalized and sends a great empowerment message to boys and girls alike. beautiful keepsake for that super special someone! Both sets of parents were so impressed by this unique beautiful gift celebrating their child. The colorful design will compliment any dÃ©cor and is gender friendly. Love it! So different. I smile everytime I look at it.